If you try to search the web for the best pressure washer hose, you’re going to run across a host of products claiming to be that. Rather than take their word for it, we conducted a thorough assessment of the top five right here. Let’s learn more about pressure washer hoses. You want a pressure washer hose that will get the job done. Unfortunately, one that has that much power goes through a lot of abuse. The water that passes through them is highly pressurized. Eventually, the hoses get worn and need to be replaced. That’s why when you’re on search for the best pressure hose out there, you’ll want to be sure it’s a heavy-duty hose. Let’s look and see what else you should look for. Length: It is better to have a longer hose than you need rather than one that’s too short. Just make sure it’s easy to pull back if it’s lengthy. Diameter: There are three options: small 1/4”, medium 5/16”, and large 3/8”. Small diameter (1/4”) hoses are often for 2700 psi pressure washers and consumer grade. Medium (5/16”): these are for 2700 to 3400 psi pressure washers. They’re suitable for prosumer pressure washers. Large (3/8”): these hoses can handle up to 5000 psi. These are prosumer level, thicker and can handle heavy water volume. 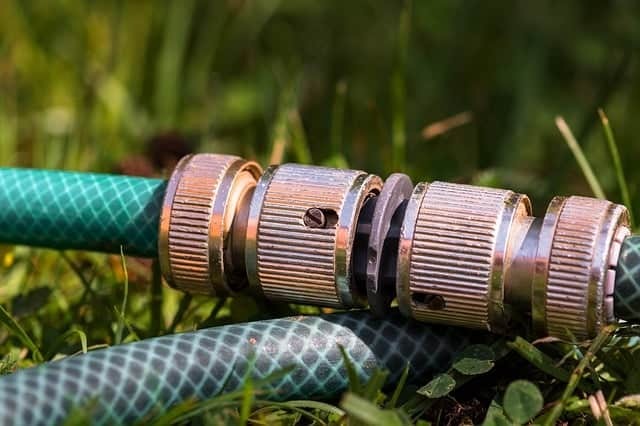 Durability: Look for hoses with solid connectors and a leak-free design. Durability becomes even more important if the hose will be exposed to sunlight. Application: Read the fine print before making a purchase. Some hoses are only meant for cold water use, while others can handle warm water. Don’t use a hose for something it wasn’t designed for. Materials: The most common materials are polyurethane, rubber and PVC plastic. PVC Plastic: PVC plastic hoses are the most popular. These hoses do the job, are affordable, and are widely available. However, they’re not very flexible. It is hard plastic and durable, but if it’s too difficult to work with, consider polyurethane or rubber. Rubber: Rubber hoses are more flexible than hard plastic, which makes up for the heavier weight. Rubber hoses don’t curl or kink either. One drawback is some poorly designed hoses could stain concrete when dragged across. Polyurethane: These are surrounded by bendable, transparent plastic, and they have the flexibility of rubber without the marring. Synthetic Materials: Some pressure washer hoses are made from proprietary materials so they’re lighter than standard pressure washer hoses. Psi Capacity: The hose’s psi capacity determines what types of pressure washers can be used with it. 2000 psi and below: These are light duty hoses. They’re suitable for cars, boats, trucks, and other vehicles. They’re also useful for cleaning decks, driveways, etc. 2000 to 2800 psi: These hoses are for light to medium duty. They can handle the same tasks as 2000 psi hoses, but with more power. 2900 to 3300 psi: These hoses are for heavy-duty pressure washers. These have enough power for story cleanup jobs and paint surface preparation. 3300 psi and up: These hoses are the most powerful and are better-suited for professional, heavy duty use. How are Hoses Connected to Pressure Washers? All pressure washer hoses have connectors. Here’s a video explaining how to hook up a hose to a pressure washer. These hoses have two connectors — one to the spray gun and one for the pump. The hose is connected to the pump by snapping or twisting them together. There are however, several ways to join a spray gun to a hose. Some have male or female connectors, while others have a quick connect plug. Hoses are easy to hook up with pressure washers, but the process may vary slightly, depending on the model. Check the manual for details. What are the Benefits of Pressure Washer Hoses? Hoses let you make full use of your pressure washer’s power. Water is delivered at the right pressure level, and the stream doesn’t lose pressure. Well-made hoses are durable and meant for regular, heavy-duty use. Quality pressure washer hoses are easy to reel in. Most hoses are 20 to 25 feet long. This is usually enough for most jobs, extension hoses are available for bigger jobs, and 50 foot hoses are not uncommon. The Raptor Blast 4000 PSI Black Wire Braid Pressure Washer Hose can produce pressure up to 4000 psi, which is sufficient to remove embedded dirt on cars or an SUV. With a length of 50 feet, the hose is long and won’t impede your movement. It has a wire braid and black bend restrictors that make the hose convenient to use. Hot water helps remove dirt, so it’s a good thing the Raptor Blast can handle up to 275 degrees. You may not use such high temperatures, but it’s good to know it’s capable of handling the heat. While the Blast Raptor is most suitable for cars, there’s enough power here to pressure wash other surfaces and even a house. Pulling back in is the only issue, but otherwise it’s solid. Karcher Quick Connect Extension is designed specifically for Karcher electric pressure washers. With a length of 25 feet, this extension hose gives your pressure washer the flexibility for heavy-duty cleaning. As long as your pressure washer is Quick Connect-compatible, the extension will work fine. The extension can handle up to 2000 psi max. This level is good enough for small cars as well as patios, decks and sidings. The extension is well-made and can handle temperatures up to 104 F.
The extension works with all Karcher pressure washers except the K2000, K1900, K1800, K1700, and the K1700 Cube. If your pressure washer isn’t among those listed here, then it should work. Once set up, you’ll notice the couplers are tight and it won’t leak like other hoses. As the name implies, this is a lightweight hose, so carrying it around won’t be an issue. The outlet is 22 mm and the inlet is 22 1 1 mm, which explains its lightness. But as far as performance is concerned, the AR hose delivers. The AR North America Lightweight Hose has a maximum force of 3000 psi, which is good enough for decks, patios, cars and driveways. The fact that it is oil resistant is another advantage over other pressure washers as it’s easy to clean up. The thin wall is the only drawback, but overall the hose is well made. The O-ring connectors are high-quality and it won’t leak. With its durable build and psi, it’s good enough for home and even some commercial use. The Apache 10085591 hose is a heavy-duty pressure washer. With a maximum psi of 3700, it is on par with professional-level pressure machines. You can use this for boats, cars, driveways, pavements, and multi-story cleaning. At maximum pressure, the hose can remove surface paint. The Apache has a temperature range of -4 to 140 degrees F, and it is suitable for cold applications. You can’t use this for steaming, but for other tasks, it’s well suited. You’ll also notice the hose is light. The material is 60% lighter compared to rubber, so you won’t have problems lifting it. The hose is flexible, so you can maneuver it around your car or whatever you’re washing. Even though it’s light, the hose is durable. Lastly, the Apache comes with the hardware necessary to hook to your pressure washer. Briggs & Stratton 1/4-Inch X 25′ Pressure Washer Hose works with pressure washers up to 2400 psi. At maximum level, it’s capable of washing cars, decks, sidings, and other surfaces. The hose feels a little stiff, but that doesn’t mean you can’t flex or maneuver it around. The hose is compatible with several Briggs & Stratton pressure washers, so chances are your model will work with it. The hose is a lightweight compared to others in its range, and that’s to its advantage. Whether you want to clean a walkway or driveway, this pressure washer hose can get it done. Even if the hose is stiff, the overall quality and its durability give this an edge over others. It’s nothing flashy, but it gets the job done. 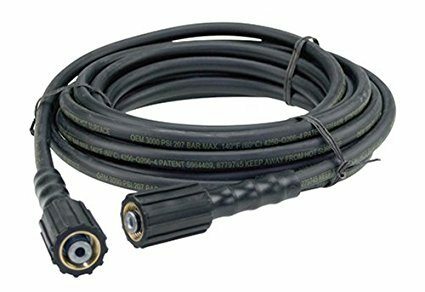 GarageChief featured here five high-quality pressure washer hoses, but the Raptor Blast 4000 PSI Black Wire Braid Pressure Washer Hose is the clear winner. With support for 4000 psi pressure, its specs are equal to professional pressure washers. Whether it’s a car, light truck, or a thorough house cleaning, the Raptor Blast hose can handle it. The hose works with different pressure washers, and it’s versatile. Even if you don’t have need for this much psi, it’s good to know the option is there. The other pressure washer hoses are decent enough, but if you’re looking for maximum power, the Raptor Blast is the best option.